It is important to determine the real motivation for the owner of a re-sale condo to sell the property. This will assist you in knowing how to negotiate in terms of your offer price and terms and general strategies. The motivation for sale could be a positive or negative one. If the vendor is selling in a buyer’s market, be particularly thorough in finding out why the vendor is selling in a market that is clearly disadvantageous in terms of the negotiating climate and eventual sale price. Ill health of one or both home owners. Retirement and therefore relocation or downsizing house size needs, or desire to take some of the equity out of the house for retirement purposes. Owner lost money in a business or other investment venture and needs to sell the house to pay off the debt. Owner has not made payments on the mortgage due to personal or financial problems, resulting in court proceedings by the lender. This could be in the form of an order for sale or foreclosure proceedings. The length of time before the house could be sold in the above circumstances varies depending on the provincial jurisdiction. Owner wants to sell in a seller’s market. Owner is concerned that the market is changing and could become a buyer’s market. Owner is testing the market to see what the market will pay, without any serious attempt to sell. Children leaving the home and therefore downsizing of house size needs. Desire to buy a larger home due to increasing family size or needs. This could also be due to having an extended family (e.g., parents or relatives). Desire to trade up to a nicer home or better neighbourhood. Desire to buy a house with a rental suite in basement for revenue purposes. There are many reasons why a condo bought for investment could be listed for sale. It does not necessarily mean the property has serious problems or is a bad investment. Possibly the property is poorly managed, poorly maintained, or has excessive vacancies. In many cases, an astute investor could turn the property into an attractive investment by identifying the exact problems and opportunities, devising a plan for turnaround, and buying at below market value. Explore to find out the real reasons why the property is for sale. Inexperienced Owner. Possibly the owner was a first-time investor who bought beyond his skills, resources, and “comfort zone,” and feels intimidated by the responsibilities, time, and risk involved. He may now have changed his mind and wishes to sell due to the personal stress being experienced. Partnership Disputes. About 75% of business partnerships at some point break up or have conflict. Maybe the property is for sale due to unresolved disputes. Another possibility is that some investors need to get out for financial reasons or changed investment goals, therefore the partnership splits up and that triggers the sale. Tax Benefits. Maybe the owner has depreciated the building as much as possible and wants to sell because the land value on which the condo is situated has gone up substantially in value. 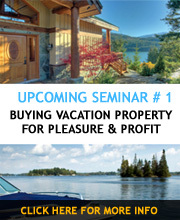 The owner wants to minimize the capital gain aspects by selling in the current market. Settling of an Estate. If the owner of the property has died, the executor of the estate wants to settle the estate reasonably quickly, and the property could therefore be priced at fair market value or below in order to entice a sale. Run-down Properties. Due to management or financial difficulties, the property could visibly deteriorate, causing the owner to want to sell. Some of the reasons are discussed in further detail below. Poor Management. This could be because the owner is attempting to manage it himself, but lacks the skills, knowledge, or personality to do it profitably. Maybe the owner has hired the cheapest management firm and they do the least amount possible. If an owner lives outside the city, province or country, possibly the management company is indifferent and allows the property to deteriorate, causing problems to occur. Another reason for poor management is that the owner is draining the revenue property by taking out too much money personally. This could result in a shortfall of the revenue required to meet necessary expenses. Excessive Vacancies. If a condo development has a lot of condos for rent, and suffers from ongoing vacancies, it could be because the building is run-down or has poor management; there are unstable employment opportunities in the community; there is the wrong mix of tenants in the building; there are more attractive competing condo buildings, or the rents are too high. Whatever the cause, the vacancy situation is probably causing serious cash flow problems for the owner.